Throughout his 15-year career with Enterprise, William T. has learned many valuable lessons, but one remains top-of-mind: take care of one another. William started his career as a Management Trainee in South Florida. He successfully navigated a path through several promotions to where he currently sits as Director of Rental Replacement for the South Florida Operating Group. William recently connected his Enterprise career with the brand’s namesake, the USS Enterprise, through a unique lunch encounter. Today, William makes valiant efforts to ensure he mirrors Jack’s passion and commitment in his daily interactions with peers, customers and even complete strangers. William recently put into practice the values Jack instilled in him. 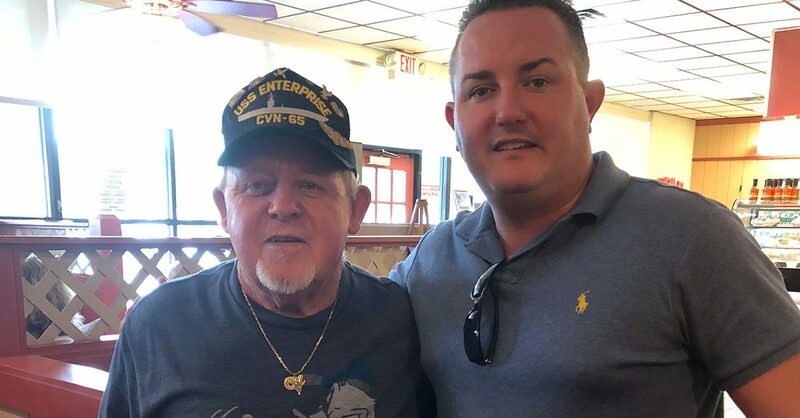 While out to a barbeque lunch with his parents, William noticed a veteran wearing a USS Enterprise hat. He didn’t hesitate to subtly flag down the waitress and pay for the veteran’s meal. The veteran was touched by William’s kind deed and said he had never experienced someone purchasing his meal previously. He was honored to hear that the same lessons he learned while onboard the USS Enterprise CVN-65 live on today through Enterprise’s employees. It wasn’t just his Enterprise family who inspired William to offer a random act of kindness toward the veteran. William’s grandfathers served in World War I and World War II, and he never overlooks their sacrifices. He has also came to appreciate the same sacrifices Jack made in the Navy and the enduring legacy of his military service.